Cisco predicts more than 15 billion network-connected devices by 2015, reaching 966 exabytes (10^18 bytes) per year — close to 1 zettabyte (10^21 bytes). Average global IP traffic in 2015 will reach 245 terabytes per second, equivalent to 200 million people streaming an HD movie (1.2 Mbps) simultaneously. This growth will primarily be driven by the global online video community, which will increase by approximately 500 million users by 2015, up from more than 1 billion Internet video users in 2010, Cisco says. An increasing number of devices: The proliferation of tablets, mobile phones, connected appliances and other smart machines is driving up the demand for connectivity. By 2015, there will be nearly 15 billion network connections via devices — including machine-to-machine — and more than two connections for each person on earth. More Internet users: By 2015, there will be nearly 3 billion Internet users — more than 40 percent of the world’s projected population. More video: By 2015, 1 million video minutes –+ the equivalent of 674 days — will traverse the Internet every second. By 2015, the Asia Pacific region will generate the most IP traffic (24.1 exabytes per month), surpassing last year’s leader, North America (22.3 exabytes per month), for the top spot. 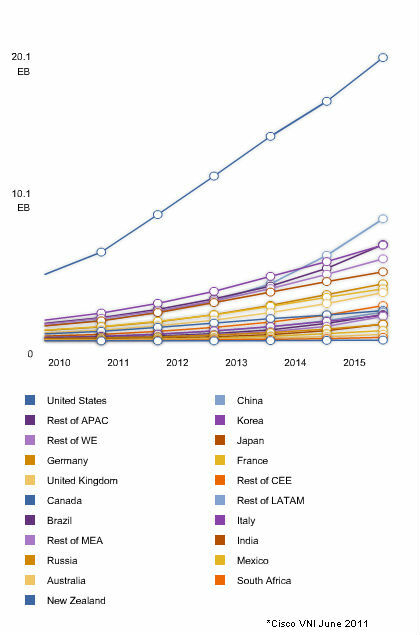 The fastest-growing IP-traffic regions for the forecast period (2010–2015) are the Middle East and Africa, surpassing last year’s leader, Latin America.